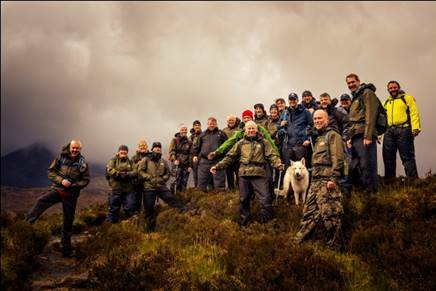 On 6th June 2015, an intrepid team of twenty from Colorado and colleagues, undertook a challenge to climb Bruach Na Frithe in aid of the Action on Depression charity. Bruach Na Frithe a 3,143ft Munro on the Isle of Skye, a significant test for the majority with no hill climbing experience. Added to the already challenging prospect was the weather which was described on the Mountain Climbing weather report as “appalling” for the day of the climb. Sure enough on the morning of the walk the weather was extremely poor with gale force winds, heavy rain and fog. However, undaunted, the team set off into the storm. The suggestion at the start was as long as one or two made the summit we would consider it a success, however it soon became apparent if one was going we would all be going, and sure enough after three and a half hours of climbing we arrived at the top – as a team! 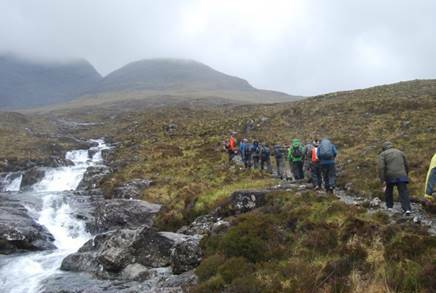 After a brief bite to eat, it was back on with the backpacks and the three hour climb back down the Munro, arriving back at base camp, very soggy, for a well earned drink! This was followed in 2016 by scaling Sgurr Banachdich at 3,166ft.